Fishing and lake maps have contour lines, map symbols and GPS coordinates that help you find bass holding structure. Hmmm, so bass will only be in 10-20% of all that water? Learning to read fishing and lake maps will help you eliminate a large amount of unproductive water. Knowing map symbols, understanding map scale and correctly reading contour maps for fishing, both before you go as well as when on the water, will increase your chances of finding bass. 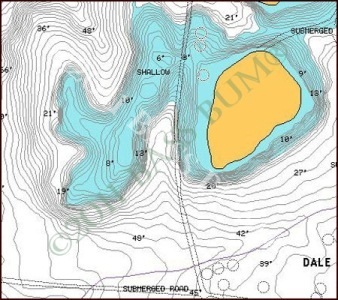 Hydro-graphic maps are those that reflect the changes in bottom contours of a body of water. And what is a change or variation in the bottom of a lake called? Structure. As they are creatures of habit bass behavior is quite predictable. The challenge is determining where and when their habitual behaviors will take place. But one thing is for certain. Behavior of bass that turns on feeding, spawning, safety and seeking comfortable habitat will revolve around structure and cover. Structure and cover are where bass hang out, with structure being changes in the slope and shape of lake, reservoir or river bottoms and cover being something resting or growing on the bottom. But of course all structure and cover are not equal in their ability to call and hold bass. Nevertheless, we bass anglers must seek it out in of its many forms should we hope to find any bass. So how do we find structure and cover? With the aid of hydro-graphic maps which are fishing lake maps rather than aids in navigation. That is, maps that use contour lines to illustrate the changes in lake and river bottom structure. By reading contour maps, not only while on the water but more importantly before we travel to the water, our time spent hunting bass can be greatly reduced. 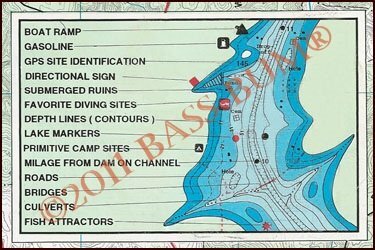 Of the numerous legend map symbols you'll find on the map legends of lake fishing maps the one most important to a bass fisherman is the "contour line". Why? Because they are the indicators of the shape and changes in the bottom's structure and thus the water depth. These lines can reflect intervals from one to forty feet depending on the nature of the map. These lines are marked with numbers that indicate depth. Follow a contour line with your finger and the depth indicated on that line will be consistent along its complete course. The smaller the interval between lines the steeper the change of bottom structure. If the interval between these lines is wide a gradual change is indicated. Maps that have contour intervals of no more than five feet are the best for bass anglers as they will give a more accurate representation of the structural features that attract bass such as submerged roads, creek channels, drop offs, humps, saddles, submerged points and flats. What are sometimes called "enhanced" fishing maps are those that show cover as well as structure. These cover features will represent grass, stump fields, submerged roads, submerged timber, building foundations, culverts and bridges. some will even show bottom types such as gravel, chunk rock or mud. The legend found on maps I use from Atlantic Mapping Inc., shown above right, have symbols for islands, submerged roads, creek channels and bridges. 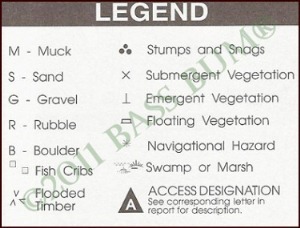 The legend at left is one used on Fishing Hot Spots, Inc. maps with symbols that represent bottom composition, vegetation, stumps and flooded timber. Handy information indeed for the bass angler. These symbols go beyond only structure defining contour lines and provide information to help the bass fisherman further narrow down unproductive water by providing the location of cover preferred by bass. Fishing and lake maps are available in digital, electronic chart format today. I don't mean the maps that are used in your depth finders. I'm referring to HotMaps Explorer. This is a CD currently available from Navionics® that provides maps of thousands of lakes across the U.S. 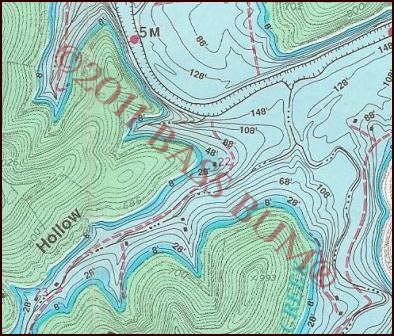 Using these digital maps on your home PC, some of which can be purchased in high definition versions with one foot contour lines, are in my opinion fantastic planning tools before heading to water. It isn't meant for use in your fish finder. It's for use at home on your PC. You can pinpoint areas to fish, print them out and head to the lake. These HotMaps® fishing and lake maps, samples of which you see here, do fall a little short relative to some "convenience" features. You are not able to place text notes on them, though you can mark GPS coordinates with a symbol. Unfortunately, the numerical coordinates themselves do not show when sections are printed. The meaning of specific symbols found on fishing and lake maps and how to read contour lines to find fish holding structure will be discussed on subsequent pages. Contour Lines on Fishing Maps - What Do They Tell You?